Roman Kreuziger (Astana) took a consolation victory from his disappointing Giro d’Italia on the vicious slopes to Alpi di Pampeago, but the big story happened on the road behind him as Ryder Hesjedal (Garmin-Barracuda) put Maglia Rosa Joaquim Rodríguez (Katusha) on the rack. The Czech, who lost more than ten minutes on the previous mountain stage to Cortina D’Ampezzo, attacked on the penultimate climb to the Passo Lavazè, and managed to hold off the Canadian as the battle between the overall favourites raged. As usual, it had been Ivan Basso’s Liquigas-Cannondale team that had asserted itself on the climbs, but three attacks from Michele Scarponi (Lampre-ISD) forced the final selection, and a number from Hesjedal finally pulled the defending champion clear. Hesjedal finally dropped Scarponi inside the final kilometre, but was not quite able to catch Kreuziger, and crossed the line 19 seconds behind the Astana rider. Rodríguez rallied in the closing metres and sprinted past Scarponi just before the line, to take third on the stage and, more importantly, preserve his Maglia Rosa by a slender 17 second margin. “I am happy with my first victory in a Grand Tour,” said Kreuziger. “I didn’t break off on the first climb up to Pampeago but waited until the Lavazè, knowing that it was a long and arduous climb. Luckily the two Omega riders [Dario Cataldo and Serge Pauwels - ed] had their minds on the classification and we managed to come to a good understanding to keep the break going. The 198km stage, which set out from the city of Treviso, was dominated by a 17-man breakaway that escaped after just 20km. In the group were: Former Maglia Rosa Adriano Malori (Lampre-ISD), Emanuele Sella (Androni Giocattoli-Venezuela), Andrey Zeits (Astana), Ivan Santaromita (BMC Racing), Stefano Pirazzi (Colnago-CSF Inox), Pierre Cazaux (Euskaltel-Euskadi), stage 18 winner Andrea Guardini (Farnese Vini-Selle Italia), Sandy Casar (FDJ-BigMat), Mikhail Ignatiev (Katusha), Adam Hansen (Lotto-Belisol), Francisco Ventoso (Movistar), Serge Pauwels (Omega Pharma-Quick Step), Juanma Garate (Rabobank), Thomas Rohregger (RadioShack-Nissan), Juan Antonio Flecha (Team Sky), Cesare Benedetti (NetApp) and Lucas Sebastian Haedo (Saxo Bank). Guardini was dropped early into the brutal climb of the Passo Manghen, then Pirazzi and Casar left the others behind on the climb to the Passo Pampeago for the first time. On the penultimate climb to Passo Lavazè, as Liquigas-Cannondale asserted itself on the front of the peloton, Dario Cataldo (Omega Pharma-Quick Step) and Kreuziger both attacked, and joined Sella and Rohregger as they regained contact with the leaders as the final climb began. Behind them, pressure from Liquigas-Cannondale, then attacks from Scarponi, saw the lead group reduced to just the six riders that had battle out the Cortina stage. With him were Basso, Hesjedal, Rodríguez, white jersey Rigoberto Uran (Team Sky), and Domenico Pozzivivo (Colnago-CSF Inox), but as Hesjedal attacked they were scattered behind him, and the Canadian finally broke free. After an easy stage for the sprinters the day before, the peloton was now faced with one of the toughest. After rolling out of the city of Treviso, and crossing the Veneto plain, stage 19 would climb the fearsome 1st category Passo Manghen - whose final 6.5km averaged more than 10% - before climbing to the finish line and starting mountainous closing circuit. This final 40.7km loop would pass through Alpi di Pampeago and continue to the top of the 2006 metre high Passo of the same name, it would descend to the foot of the climb to the 2nd category Passo Lavazè, then retrace its steps the the first category finish line. The final 4km of the 7.7km climb to Alpi di Pampeago would average almost 12%, and were made famous by the late Marco Pantani, who destroyed the field there on his way to overall victory in 1998. Casar, Pauwels, Garate, Rohregger, Benedetti tried to escape immediately, as part of a ten-man group, which included stage 15 winner Matteo Rabottini (Farnese Vini-Selle Italia), but were pulled back before they could get far. Just a few kilometres further on though, they succeeded, in the company of Malori, Sella, Zeits, Santaromita, Pirazzi, Cazaux, Guardini, Ignatiev, Hansen, Ventoso, Flecha and Haedo. Many in the group were doubtless looking either for personal glory, or to help their team captains later on; Sella, for instance was the last rider to win in Apli di Pampeago in 2008. Some, however - like the previous day’s winner Guardini - were doubtless trying to get as far up the road as possible, to avoid being left too far behind when the climbers in the peloton accelerated later on. Casar was the danger man overall, just 12’25” behind Rodríguez in 19th place, but the Frenchman had lost time in the previous mountain stage, and so was allowed to go. They had opened a gap of ten minutes as the climb Passo Manghen began, and they continued to climb together on the relatively gentle earlier slopes. Despite the relatively easy pace, that most of the group was able to cope with, Guardini found himself dropped already and faced yet another climb alone. With 78km to go for the leaders - and with 3km still to climb - the peloton was 7’30” behind, as Guardini was picked up. Pirazzi sprinted away to take the points over the top, as the TV moto obstructed Rohregger behind him, and began the technical first part of the descent alone. In the peloton behind, both Liquigas-Cannondale and Lampre-ISD had moved ahead of Katusha, as they entered the final kilometre of the climb, and they rolled over the top 5’55” behind. Pirazzi and Rohregger were descending together now, on the narrow, twisty, wooded road, but the rest pulled across them as it widened and straightened. Liquigas-Cannondale began to lift the pace at the front as it arrived at the bottom. As Flecha led over the Traguardo Volante sprint, in Tesero with 48.5km to go, it was down to just 3’52. Rohregger began to up the pace as the climb to the Passo Pampeago began, pulling Pirazzi and Casar away from the others. Liquigas-Cannondale was on the charge now though, and was little more than three minutes back as the three leaders reached the steepest section of the climb. The pace at the front was beginning to tell, and the peloton was shrinking rapidly. Among the early casualties was eighth overall, and the last overall hope for the Astana team, Paolo Tiralongo. Up ahead, Rohregger was struggling too, and Casar and Pirazzi left him behind. Across the line for the first time, to start the long mountainous loop, the two leaders were 32 seconds ahead of Rohregger, with Sella, Pauwels, Flecha, Zeits and Garate a minute back, while the peloton was at 3’18”. There were still 2.8km to climb to the Passo itself though, but - as Casar allowed Pirazzi to take the points over the top - it had gone out a few seconds to 3’26”. Dario Cataldo (Omega Pharma-Quick Step) jumped away at this point, followed by Kevin Seeldraeyers (Astana), then Kreuziger jumped across to his teammate, and the two Astana riders began to work together. With 25km to go Kreuziger went alone and soon caught Cataldo, who was now with Pauwels. Pirazzi led Casar over the top of the climb, but this time Rohregger and Sella were just 24 seconds behind them, while Kreuziger, Cataldo and Pauwels were 1’54” back. The peloton was now 2’48” behind the leaders as the long descent to the foot of the final climb began. With 11km to go Rohregger and Sella rejoined the leaders and, as Kreuziger led onto the early slopes, he had cut the gap to just 54 seconds and, as Rohregger began to struggle again, it continued to fall. With 6.4km to go, Pirazzi attacked, Casar followed again, and then countered; the two riders were on the climb together again, as they left the others behind once more. Garmin-Barracuda was leading the peloton at this point while, up ahead, Kreuziger and Cataldo pulled up to Rohregger and Sella and began pulling them back up towards the leaders. At the five kilometre banner the gap had been cut to 1’56” by Garmin-Barracuda, but the four chasers were now just a few seconds behind the leaders. Sella and Rohregger found the pace too strong again, as Kreuziger tried to jump across the gap; with four kilometres to go Pirazzi put in yet another attack, and this time Casar could not respond. As Peter Stetina pulled over Damiano Caruso pulled Basso forward, and began to bury himself for his team leader; with 3.5km to go Basso himself took over, and accelerated again. Scarponi attacked around him however, causing the selection that Basso hadn’t been able to; only Basso, Hesjedal, Rodríguez, Uran and Sky teammate Sergio Henao, Mikel Nieve (Euskaltel-Euskadi) and Pozzivivo could follow. Up ahead Kreuziger, with Casar in tow, caught and passed Pirazzi, while another jump from Scarponi shed Henao and Nieve, to reduce it to the same six as on stage 17. Scarponi tried again, but it was Hesjedal’s attack with 2.5km to go that finally split the group. Only Scarponi could follow the Canadian and they soon caught Cataldo and Pirazzi, but Pozzovivo was gradually leading Maglia Rosa Rodríguez across. Hesjedal went again though, the Canadian was gradually gaining on Kreuziger up the road, as the Czech approached the final kilometre, and gradually pulling away from Rodríguez. One more kick from the Canadian finally gapped Scarponi, and he was homing in on the Astana rider ahead of him. He was running out of road however, and it was looking as though Kreuziger would just make it. Kreuziger dug deep into the final 200 metres, through the final tunnel and, after briefly getting out of the saddle to keep his momentum as the line approached, raised both arms as he took the line. Hesjedal elatedly crossed just 19 seconds later, but Rodríguez had rallied in the final metres and sprinted past Scarponi to take third, having done just enough to keep his Maglia Rosa. FRA 10 John Gadret (Ag2R - La Mondiale) s.t. ITA 12 Damiano Cunego (Lampre - ISD) s.t. ITA 27 Emanuele Sella (Androni Giocattoli - Venezuela) s.t. ESP 42 Juan Manuel Garate (Rabobank Cycling Team) s.t. ITA 46 Francesco Failli (Farnese Vini - Selle Italia) s.t. ITA 48 Enrico Battaglin (Colnago CSF Bardiani) s.t. ESP 58 Amets Txurruka (Euskaltel - Euskadi) s.t. ESP 59 Ivan Velasco Murillo (Euskaltel - Euskadi) s.t. 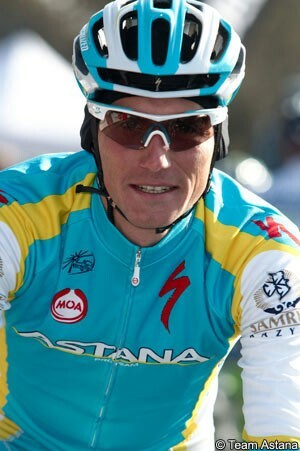 UKR 60 Volodymyr Gustov (Team Saxo Bank) s.t. ITA 63 Alessandro Ballan (BMC Racing Team) s.t. LUX 64 Ben Gastauer (Ag2R - La Mondiale) s.t. LAT 65 Gatis Smukulis (Katusha Team) s.t. GER 66 Grischa Niermann (Rabobank Cycling Team) s.t. ITA 68 Cristiano Salerno (Liquigas - Cannondale) s.t. ESP 74 Jose Herrada Lopez (Movistar Team) s.t. SUI 76 Mathias Frank (BMC Racing Team) s.t. ITA 80 Fabio Sabatini (Liquigas - Cannondale) s.t. FRA 81 Francis Mourey (Equipe Cycliste FDJ - BigMat) s.t. ITA 85 Matteo Montaguti (Ag2R - La Mondiale) s.t. AUT 89 Stefan Denifl (Vacansoleil - DCM Pro Cycling Team) s.t. GBR 93 Ian Stannard (Sky Procycling) s.t. ITA 100 Matteo Rabottini (Farnese Vini - Selle Italia) s.t. ITA 106 Simone Ponzi (Astana Pro Team) s.t. ITA 107 Matteo Tosatto (Team Saxo Bank) s.t. NED 108 Brian Bulgac (Lotto - Belisol Team) s.t. ITA 109 Matteo Bono (Lampre - ISD) s.t. ITA 110 Fabio Felline (Androni Giocattoli - Venezuela) s.t. BLR 111 Aleksandr Kuschynski (Katusha Team) s.t. ITA 112 Sonny Colbrelli (Colnago CSF Bardiani) s.t. BEL 113 Dennis Vanendert (Lotto - Belisol Team) s.t. SUI 114 Andreas Dietziker (Team NetApp) s.t. ITA 115 Daniele Pietropolli (Lampre - ISD) s.t. FRA 116 Julien Berard (Ag2R - La Mondiale) s.t. LTU 117 Ramunas Navardauskas (Garmin - Barracuda) s.t. GER 118 Andreas Schillinger (Team NetApp) s.t. BEL 119 Julien Vermote (Omega Pharma - Quickstep) s.t. AUS 120 Jack Bobridge (Orica - GreenEDGE) s.t. ESP 121 Miguel Minguez (Euskaltel - Euskadi) s.t. KAZ 122 Alexandr Dyachenko (Astana Pro Team) s.t. NZL 123 Jesse Sergent (RadioShack - Nissan) s.t. CAN 124 Christian Meier (Orica - GreenEDGE) s.t. USA 125 Taylor Phinney (BMC Racing Team) s.t. NED 126 Martijn Keizer (Vacansoleil - DCM Pro Cycling Team) s.t. SUI 127 Oliver Zaugg (RadioShack - Nissan) s.t. RUS 128 Pavel Brutt (Katusha Team) s.t. POL 129 Michal Kwiatkowski (Omega Pharma - Quickstep) s.t. ESP 130 Adrian Saez De Arregi (Euskaltel - Euskadi) s.t. ESP 131 Victor Cabedo Carda (Euskaltel - Euskadi) s.t. ITA 133 Sacha Modolo (Colnago CSF Bardiani) s.t. DEN 136 Alex Rasmussen (Garmin - Barracuda) s.t. FRA 137 Geoffrey Soupe (Equipe Cycliste FDJ - BigMat) s.t. NOR 138 Gabriel Rasch (Equipe Cycliste FDJ - BigMat) s.t. BEL 139 Olivier Kaisen (Lotto - Belisol Team) s.t. NZL 140 Jack Bauer (Garmin - Barracuda) s.t. BEL 141 Sebastien Rosseler (Garmin - Barracuda) s.t. POL 142 Bartosz Huzarski (Team NetApp) s.t. CAN 143 Dominique Rollin (Equipe Cycliste FDJ - BigMat) s.t. CAN 144 Svein Tuft (Orica - GreenEDGE) s.t. AUT 145 Daniel Schorn (Team NetApp) s.t. AUT 146 Matthias Brandle (Team NetApp) s.t. FIN 147 Jussi Veikkanen (Equipe Cycliste FDJ - BigMat) s.t. POL 148 Maciej Bodnar (Liquigas - Cannondale) s.t. AUS 149 Luke Roberts (Team Saxo Bank) s.t. RSA 150 Robert Hunter (Garmin - Barracuda) s.t. NOR 151 Alexander Kristoff (Katusha Team) s.t. ITA 152 Marco Bandiera (Omega Pharma - Quickstep) s.t. ITA 153 Giacomo Nizzolo (RadioShack - Nissan) s.t. AUT 154 Bernhard Eisel (Sky Procycling) s.t. BEL 155 Nikolas Maes (Omega Pharma - Quickstep) s.t. ITA 156 Roberto Ferrari (Androni Giocattoli - Venezuela) s.t. ESP 157 Benat Intxausti (Movistar Team) s.t. GER 158 Timo Seubert (Team NetApp) s.t. GBR 159 Mark Cavendish (Sky Procycling) s.t. SLO 160 Gregor Gazvoda (Ag2R - La Mondiale) s.t. FRA 161 Mickaël Delage (Equipe Cycliste FDJ - BigMat) s.t. GBR 136 Ian Stannard (Sky Procycling) s.t.